The Coleus forskohlii plant is a member of the mint family that is found naturally growing in sunny regions in Asian countries such as India, Nepal, Thailand and Sri Lanka. Traditionally the roots have been used as a medicine, and this relates to their content of a chemical called forskolin. However, although the active chemical in the Coleus forskohlii plant is forskolin, other compounds within the root are thought to increase the absorption and metabolic effect of the isolated forskolin. Biochemically forskolin is able to activate the enzyme adenylate cyclase, which in turn is responsible for increasing cellular concentrations of the second messenger cyclic AMP (cAMP). Cyclic AMP in turn is responsible for activating protein kinase A, which causes a number of cellular changes. Adrenaline and glucagon activate receptors in tissues, and these in turn activate adenylate cyclase. As forskolin increases cAMP levels by activating adenylate cyclase, it could be expected that forskolin has health effects relating to these hormonal systems. And this is exactly what is found (figure 1). In particular increased cellular levels of cAMP cause a decrease in platelet activation, relaxation of arteries, increase cardiac output force, relaxation of smooth muscle, increased insulin secretion, increased thyroid production and increased lipolysis. Forskolin may also bind and inhibit certain membrane transporters and inhibit platelet-activating factor (PAF) binding to its receptors, thus decreasing the allergic and inflammatory effects of PAF. The biochemistry of forskolin make it useful in the treatment of allergic conditions such as eczema and psoriasis. The smooth muscle relaxing effects of the herb make it particularly useful at increasing the diameter of the airway in asthmatics. The cardiac stimulating, smooth muscle relaxing and platelet inhibiting effects of forskolin make it useful in the treatment of high blood pressure. The ability of forskolin to increase thyroid function and increase lipolysis may make is useful in the treatment of obesity, although it can never be a substitute for a high quality diet. Figure 1. 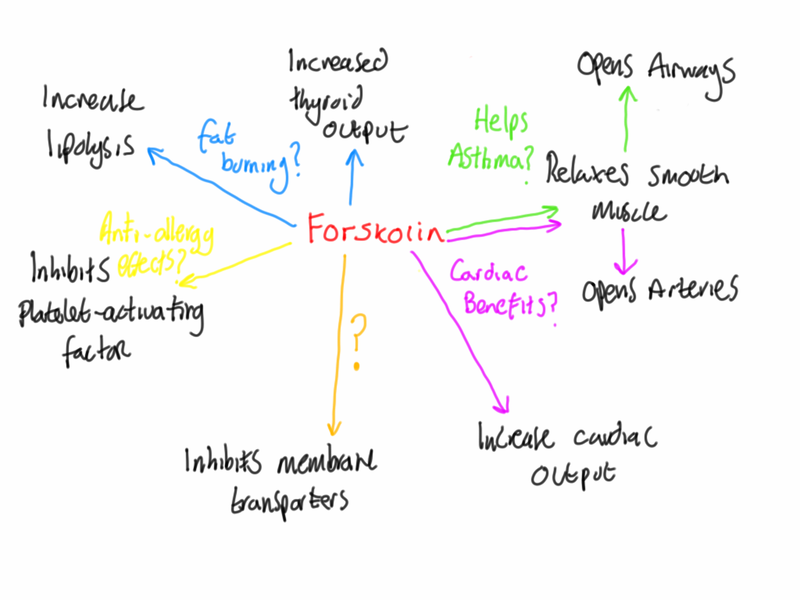 The metabolic effects of forskolin in humans. Why Is Vitamin E Cardioprotective?